Voltorb in game: 6,909 Who? Important notice! Pokemon Voltorb is a fictional character of humans. Voltorb is a spherical Pokémon that looks like a Poké Ball with a face, minus the button. The top half is red, while the bottom half is white. Because of its resemblance to Poké Balls, it is thought that it was breed when one was exposed to an energy pulse. It was first seen in the plant where modern Poké Balls were invented. 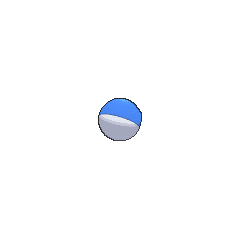 Voltorb is generally found in power plants and other areas with electric fields. It has a volatile temperament, and will explode if bumped or agitated. Voltorb first appeared in The Ninja Poké-Showdown. Koga kept a bunch of these in his Gym as booby traps. Voltorb also appeared in So Near, Yet So Farfetch'd. Team Rocket received them from the Backpack-switching thief, thinking they were Poké Balls with rare Pokémon in them, as well as their Arbok, Lickitung and Weezing. When Team Rocket found out they were not, the Voltorb started to explode in their balloon. They dumped most of the Voltorb on the thief, prompting him to quit his crime spree, but a single Voltorb sent them blasting off. A sole Voltorb lived amongst the Electrode in The Underground Round Up. Although Misty was terrified of it, the Electric-type befriended her Togepi, and the baby Pokémon was sad when it had to leave. In Love, Pokémon Style, three Voltorb were the cause of Ash's Kingler's injury. They rolled down a hill but were caught by Kingler, shocking it in the process. Wattson used a Voltorb in his Gym battle with Ash in Watt's with Wattson?. It was easily defeated by Ash's Pikachu, which had become super-charged during an incident at the Mauville Gym. In Bucking the Treasure Trend, several Voltorb attacked Ash and his friends. A Voltorb appeared in the Hoopa's Surprise Ring Adventures short Ball Pickup. Ash is shown to have a clock that is shaped like a Voltorb in Pokémon - I Choose You!. The clock can open up across the middle, showing the time and making a Pidgey pops out of it. In Ditto's Mysterious Mansion, Voltorb comes on stage in Duplica's flashback as her Ditto tries to transform into one. A Voltorb made an appearance in The Breeding Center Secret. Multiple Voltorb were among the Pokémon seen at Professor Oak's Laboratory in Showdown at the Po-ké Corral. Voltorb also appeared in Pallet Party Panic, at a party among other Pokémon. A Voltorb belonging to an unnamed Trainer, was brought to the Pokémon Center in The Lost Lapras. A Voltorb was among the Pokémon controlled by Cassidy and Butch in Pikachu Re-Volts. Voltorb also appeared in The Power of One. A Voltorb was one of the Pokémon seen at the Pokémon Swap Meet in Tricks of the Trade. A Voltorb was one of the Pokémon stolen by Butch and Cassidy in The Fortune Hunters. Several Voltorb were among the Electric Pokémon that were lured by the "Miracle Crystal" that Attila and Hun were using in The Legend of Thunder!. Voltorb is one of the Electric-type Pokémon that was seen in the lake with crystal in As Clear As Crystal. 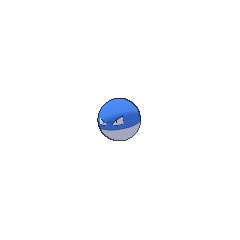 A Voltorb also appeared in Celebi: Voice of the Forest and Pokémon Heroes: Latios & Latias. A Voltorb was seen training alongside its Trainer in You're a Star, Larvitar!. A Voltorb was used by one of the students of the Pokémon Trainer's School in Gonna Rule The School!. A Voltorb made a small appearance in Pearls are a Spoink's Best Friend. Spoink mistook it for a pearl. In May's Egg-Cellent Adventure, two Voltorb attack May as they are trained to do so when anyone steps foot on Nicolette's property. A Voltorb disguised as a watermelon appeared in the credits of Arceus and the Jewel of Life. It exploded when Jessie and James picked it up after falling for its disguise. Seven Voltorb appeared in The Future Is Now, Thanks to Determination!. 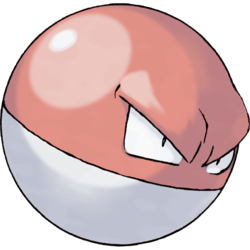 A Voltorb appeared in File 3: Giovanni under the ownership of a Trainer Red defeated in a battle. 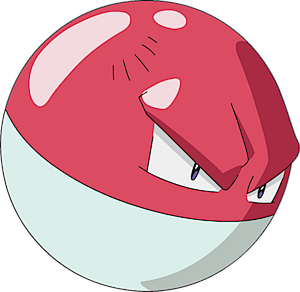 Voltorb is a Pokémon that looks just like a Poké Ball, even in its height, however other Voltorb are shown to vary in sizes. 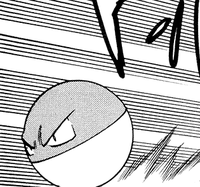 Voltorb debuted in the Red, Green & Blue chapter in its own round, Danger: High Voltorb. Here, Red tries to touch one aboard the S.S. Anne thinking that it is only a Poké Ball, but is zapped by it. Multiple Voltorb were seen under the ownership of Lt. Surge in Go for the Golbat where they were used in conjunction with multiple of their evolved form, Electrode, to shock Red and as projectiles. Wattson's Voltorb was only seen in the Power Plant located in New Mauville. Multiple Voltorb were among the Electric-type Pokémon that charges the Prism Tower during a blackout in Pangoro Poses a Problem. Giovanni sends out Voltorb to prevent Red from interfering with his plans on breeding Mewtwo in Bring Down the Strongest Pokémon!!. Voltorb is extremely sensitive - it explodes at the slightest of shocks. It is rumored that it was first breed when a Poké Ball was exposed to a powerful pulse of energy.